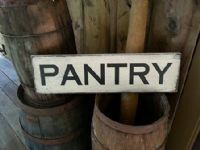 Pantry Wooden Sign. This sign measures 1 x 5 1/2 x 20 and is shown here in a distressed primitive finish of Candlelight. We do a base-coat of black under all of our signs and then the color that you choose will be on top....and then distressed and aged. For the lighter colors we will use black for the lettering. For the darker signs we use a tannish/mustard coloring for the lettering. It is done on 3/4" pine and has saw tooth hangers on back for hanging. You may choose which color you would like for your sign from the colors we offer or request the color shown.